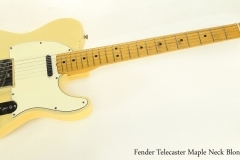 Sporting the classic blonde finish, this Fender Telecaster was built during 1966 at the Fender plant in Fullerton, California. At this point, CBS had purchased the Fender companies so this is an early CBS era instrument. It is in largely original condition, with the original pickguard. 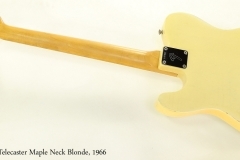 The body is ash with the original blonde finish, in 7/10 condition. The maple neck has a 1 5/8 inch nut width and of course a 25.5 inch scale length; the frets are original and somewhat low with light to medium wear. The decal is original as are the ‘double line’ Kluson Deluxe tuners. It plays well and has the classic Telecaster snap and spank. The original hard shell Fender case is included.